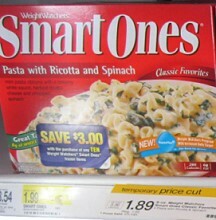 Weight Watchers Smart Ones as low as $1.29 each! You can get a pretty good deal on Weight Watchers Smart Ones right now at Target thanks to a few coupons! = $12.90 for 10 or $1.29 each after stack & Price Cut!